Fisher-Price's 10th anniversary of the Sesame Street doll is a hysterically laughing, belly-clutching, floor-thumping extreme version of itself. 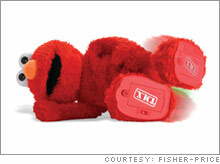 NEW YORK (CNNMoney.com) -- The much-anticipated top-secret 10th-anniversary Elmo, code-named "T.M.X. Elmo" is finally here - and it's the hysterically laughing, belly-clutching, floor-thumping Elmo. Fisher-Price, a division of No. 1 toymaker Mattel (Charts), unveiled the new T.M.X. Elmo to the world Tuesday. T.M.X. is already popping up on eBay. "T.M.X." stands for 2 things - "Tickle Me extreme" or "Tickle Me 10," representing the toy's 10-year milestone. Elmo fans should grab the new toy while they can, because industry analysts are already anticipating a shortage of Elmo T.M.X. over the holiday shopping season. Some quick-thinking consumers hoping to make a juicy profit already put up their Elmo T.M.X. for sale on eBay at double the price. Fisher-Price had been extremely tight-lipped about the special Elmo. Only a handful of company executives and a few toy industry analysts saw the toy before its unveiling. This new Elmo reacts to a "tickling" as soon as you turn it on. Its arms flap, it falls to the floor, rolls around and simply can't stop laughing. T.M.X. Elmo has three tickle spots on his chin, tummy or foot. 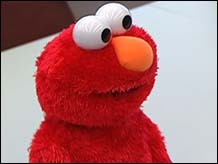 When you tickle Elmo once on any of the tickle spots, he starts to laugh and slap his leg twice, then falls down into a sitting position and rocks himself back up to standing while laughing. When you tickle him a second time, he repeats the pattern, then sits down again and falls backwards, kicking his feet while laughing even harder. And on the third tickle, he rolls over onto his tummy, thumping his hand on the floor in laughter, and then stands back up again. The new doll is priced at $39.99. According to the Toy Industry Association (TIA), total annual toy sales last year totaled $21.9 billion, down 0.2 percent from the previous year. So can the furry red monster single-handedly turn things around for the industry this year? Some industry watchers speculate that it will take more than a brilliant marketing ploy from Fisher-Price to maneuver that. Indeed, toymakers like Mattel and Hasbro (Charts) are fighting hard to expand their market share at a time when many more kids are shunning traditional toys in favor of consumer electronics such as Apple (Charts)'s iPod and portable gaming platforms such as Sony (Charts)'s PSP. If Fisher-Price scores a hit with Elmo, it would seem that a shortage could work in the company's favor by boosting demand for product. But Silver said no toymaker wants to lose sales of an extra 500,000 units during the key November and December period that accounts for as much as 50 percent of toymaker's profits and sales. Neil Friedman, president of Fisher-Price Brands, said he's confident the company can meet this year's demand target as long as Elmo sells at the levels the company has anticipated for it. "If T.M.X. becomes a runaway hit then we may have to chase the demand with extra production," he told CNNMoney.com. Friedman said Fisher-Price worked 18 months to develop the technologically advanced T.M.X. "Our job is to be innovative," he said. "We'll use technology where we feel it can enhance out toy product. and not just for technology's sake." In the meantime, Wal-Mart (Charts), KB Toys and Toys "R" Us are keen to exploit the Elmo buzz to boost sales at their stores. Wal-Mart and other toy sellers also held special Elmo events Tuesday at some locations to coincide with the launch. Wal-Mart spokeswoman Jolanda Stewart said T.M.X. Elmo was selling at the rate of 5 to 6 units per minute in its stores. "We've been extremely pleased with the customer response to Elmo," she said. "Crowds were at Secaucus ( N.J.) Wal-Mart ready to pick up the the lil' guy early this morning and the response to the furry loveable guy was overwhelming. 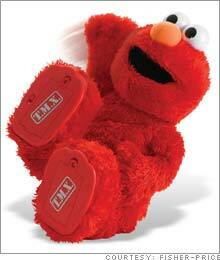 Our online pre-sales of Elmo have exceeded our sales forecast by 150 percent." Toys "R" Us' flagship location in midtown Manhattan was already sold out of T.M.X. Elmo two hours after the store opened. KB Toys' chief marketing officer, Ernie Speranza, told CNNMoney.com that sales of T.M.X. were surpassing sales expectations at the retailer's stores nationwide. "We usually don't see this kind of hype for a new toy until mid-October when we're closer to the holiday season. It's great for the toy industry," Speranza said, adding that KB Toys opened an hour early to let shoppers buy their Elmo. Check out the hottest toys for 2006.